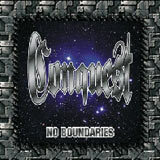 Interesting new band here… Conquest is a traditional / thrash metal band from St. Louis, Missouri. The band was kind enough to send me a promo copy of their forthcoming CD, No Boundaries accompanied by a DVD that contains 3 videos from the album. In the US, where no quality metal band gets fair exposure, Conquest is more than proud to fly the flag of metal high and proud. According to the bio from the band, the guys play a powerful blend of old school bands such as Testament, Judas Priest, Metal Church, and old Metallica. I can't tell you how many times I've read such claims on a promo sheet and been sorely let down while actually listening to the music. Well, Conquest delivers on their promise. I would best describe their style of music as a hybrid of 80's style heavy metal with mid paced thrash, yet not sounding dated. The vocals have somewhat aggressive edge to them, much like Testament's Chuck Billy or David Wayne (ex-Metal Church). Each of the songs is riff dominated, with much use of staccato style riffing that you'll find in a lot of thrash albums. The band never really goes off into a full throttle trash fest with furious shredding and wild solos, which I think the band is talented enough to do without sacrificing song quality. Still, the energy emanating from this band is enough to bring out the air guitarist in you even though the tempo is mid to semi fast paced throughout the album. Another good thing going for this band is consistency. There are no sleeper tracks on the album. Each song is an addictive standout that will maintain your attention until the very last note. The bass guitar has a strong, but not overbearing presence, which gives the overall delivery a lot of muscle. The production is pretty good for a self released album, although the drumming is a bit raw in some spots. In the end, I highly recommend fans of the aforementioned bands (as well as 80's metal fans and thrash fans) at least check out this band's website to learn a little more. The three track DVD I received with this promo demonstrates that the band is very passionate about the music they play, and I can tell you that their determination and hunger can be heard in the music itself. I love to see bands such as Conquest keeping the spirit of metal alive in North America regardless of trends or potential profits. Not only do these guys have guts and desire, but they have talent too: check 'em out.